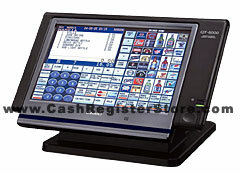 Casio QT-6000 Touchscreen Electronic Cash Registers at Cash Register Store. 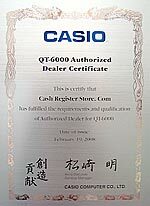 If buying new, buy either the QT-6100 or QT-6600. Now you can have the luxury of a POS system with the reliability of a cash register. Finally available is a reliable touchscreen cash register system free of a Windows operating system. Yes, operate your restaurant with an ease of mind knowing that your POS terminal will not crash on a busy Friday night. Due to the Casio QT-6000 functioning without a Windows operating system, you are free of the many common Windows based POS worries including, crashes, viruses, Windows errors, etc. The Casio QT-6000 POS touchscreen cash register system operates with its own unique cash register program. As with other standard touchscreen POS systems, access guest checks from any terminal, split checks, apply discounts, access different menus quickly, apply graphical icons for menu items, monitor status of tables, and operate as a timeclock. Plus, operate up to 16 terminals with remote kitchen printers in clusters. Many options are readily available for the Casio QT-6000 including multiple cash drawer configuration, remote customer display, remote printers, credit card interface, Berg and coin dispenser options and PC programming with CV-31 software to instantly upload program changes while operating the register. Yes, change prices and other information instantly from a back office! Due to the complexity of programming we must program this unit prior to shipment. We will program this register for $399 and only $99 for additional terminals. No yearly service contracts need to be purchased, we provide FREE lifetime tech support! 12.1" TFT color display with 800 X 600 resolution. Standard sound card w/ built-in speaker and microphone. External speaker and microphone jacks. Graphical table icons can show check total, server, last time ordered, or time check was opened. Sound files can be linked to operator sign-on, display, on/off key, or error message.